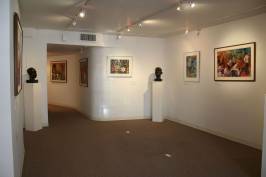 The International Raoul Wallenberg Foundation (IRWF) and The Angelo Roncalli International Committee (ARIC) present the organizations’ permanent collection in the form of two exhibits: ”Rescuers,” featuring bronze busts by Peter Bulow, and ”The Wallenberg Series,” paintings by Austro-Canadian artist Armand Frederick Vallée. ”The Wallenberg Series” was donated to the Wallenberg Foundation by Vallée’s estate. The series consists of 14 paintings that narrate the Swedish diplomat’s quest to save victims. ”The fact that the artist has not been able to finish the last painting of the series seems to speak of his difficulty to cope with Wallenberg’s own unfinished story,” stated Tenembaum upon studying the paintings. The paintings were artist created between 1985 and 1986. The organizations permanent collection is on exhibit at the IRWF’s Cultural Center, located at 34 East 67th Street, Ground Floor, by appointment only. Contact the IRWF to schedule a visit.